Starbucks is one of several big-name companies set to announce quarterly earnings over the next few days. Volatility struck the stock market last week and catalyzed sharp declines for both the S&P 500 (SNPINDEX:^GSPC) and the Dow Jones Industrial Average (DJINDICES:^DJI). 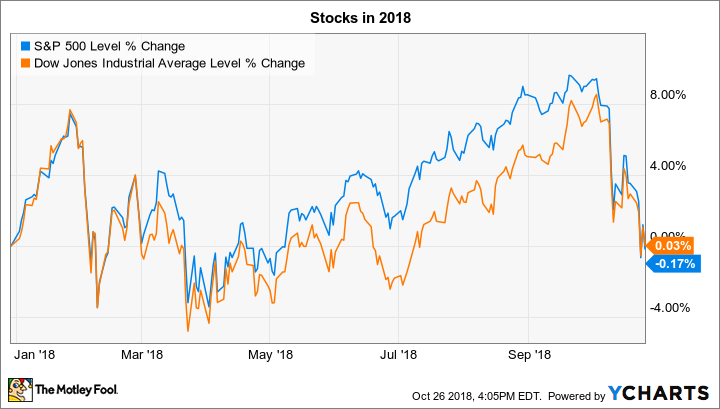 The indexes both fell by several percentage points, and both are now near break-even for the year, despite having been up by nearly 9% less than a month ago. As for the week ahead, dozens of major companies are set to post their third-quarter results over the next few trading days. Below, we'll take a closer look at the announcements that could send shares of Electronic Arts (NASDAQ:EA), Wayfair (NYSE:W), and Starbucks (NASDAQ:SBUX) moving this week. EA will post its results on Tuesday, about a week before rival Activision Blizzard reveals its quarterly numbers. Both video game publishers are benefiting from positive industry trends, including a push into digital spending that's lifting profitability. But there's a win-lose element to their rivalry, too, since Activision and EA both aim to top the sales charts with their biggest releases over the core holiday shopping season. Activision appears to have the inside track on that target this year, thanks to a solid launch of the latest chapter in its Call of Duty franchise. EA had to delay its highly anticipated Battlefield V release into late November, which ceded valuable retailing ground to Activision. Investors will get an update on EA's holiday expectations on Tuesday that reflects management's latest thinking on the Battlefield launch. The new operating numbers, meanwhile, are likely to be strong as the company continues shifting to a business model that treats games as more of a subscription service than a one-time purchase. Investors have high expectations for e-commerce specialist Wayfair's third-quarter results, which are set for release on Thursday. The home-furnishings retailer has been winning market share all year, and that includes a 49% sales spike last quarter that was achieved despite stepped-up price cuts by rivals like Overstock. Wayfair's momentum wasn't stalled by these competitive efforts, and in fact, the company's operating margin expanded as its popularity allowed it to ease back on sales and spending on advertising. Wayfair still is far from achieving bottom-line profitability, and investors aren't likely to see much progress in that direction given the aggressive spending the company is making in areas like shipping infrastructure, software engineering, and international expansion. Yet if Wayfair continues to win market share without compromising its pricing, then its long-run earnings potential will improve as it achieves bigger scale while pushing rivals out of its industry niche. Starbucks warned investors to expect some bad news in its last quarterly report, and the coffee chain delivered on that discouraging point. Sales in the fiscal third quarter rose by just 1% as customer traffic fell in its core U.S. segment and slowed to a crawl in China. These stumbles make it likely that Starbucks will miss its broader growth targets for the second straight year, as sales at existing locations have increased by less than 3% in fiscal 2018. Yet investors will be more interested in the outlook that CEO Kevin Johnson and his team issue for the upcoming year. Executives expressed confidence back in August that they would achieve a turnaround in the U.S. segment by shifting away from seasonal product sales and from the Frappuccino drinks that are sinking in popularity. The China market is being held back by temporary challenges that management believes it will fix quickly, too. On Thursday, Starbucks will have a chance to back up optimistic words with hard numbers as the company gives investors its official outlook for 2019, following two consecutive years of disappointing sales gains.